A noise gate pedal is a vital piece of equipment for many musicians. It is used to reduce the effect of a hum or hiss that is relative to noisy pickups, extended volume or basically anything that creates an unwanted electrical sound. It will also remove what is known as ‘white noise’ when overdrive or distortion units have too much gain. A common problem. In today’s world of mega multi-pedal users, this is an important piece of kit. There are many in the marketplace, some good, some not so good, but we have selected the best of the best to find out which is the best Noise gate pedal for you. Before You Buy One, What Will You Use It For? So, What’s The Best Noise Gate Pedal? Let us take a look at what Boss is producing with regard to noise suppressors. If it is anything like other Boss products it will not be flashy or over-technical, but it will be good. This is not a new pedal, in fact, it has been around since the late ’80s which is a comforting thought in terms of its performance and reliability. Configured with two options using input/output or send/return, it will operate slightly differently depending on your choice. Using input/output to go into an amp will reduce some unwanted sounds but maybe will not solve problems that may exist in other pedals. 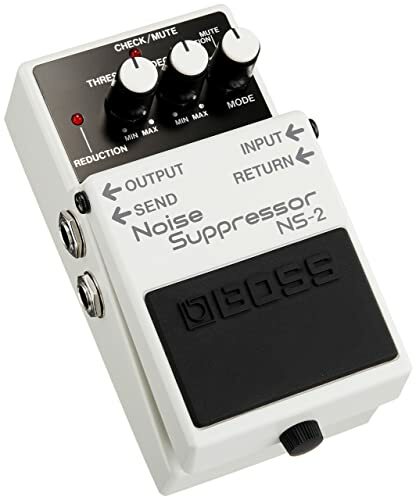 Boss provides the answer by giving you a send/return which allows you to place the pedal anywhere in your device chain. Boss created what has become an industry standard feature by designing a pedal that will recognize your guitar signal and only activate itself as it dies away, thus leaving the guitar signal untouched but cutting out any unwanted ‘afters’. The pedal is designed to age-old Boss design features making it instantly recognizable. The heavy-duty pedal is of course included. There are three principle controls, threshold, decay and mode making it easy to operate. This is more than just an unwanted noise filter, it is a ‘gate’ and any sound not required will be detected and suppressed. It will, of course, operate best in the correct place in your pedal chain and so a little experimentation will be called for to get that right. When you have it in the correct place you will hear the difference. An outstanding piece of kit at a sensible price. Runs on a 9v battery or a power supply which is not supplied. Excellent functions that dispel unwanted noise. Some may wish for extra features. 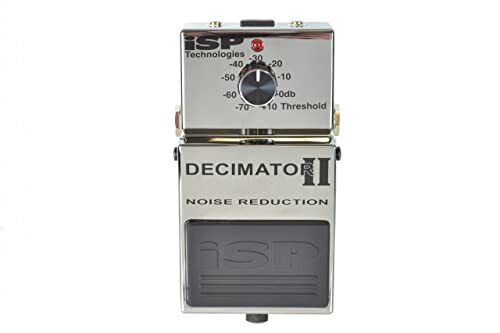 This is the second generation of ISP’s Decimator noise suppressor. In fact, it is so new that some of its technologies are still waiting for their patent. Version 1 was highly thought of but this pedal takes it a step further. We are not going to go into the technical terminologies and descriptions here regarding those improvements and upgrades but suffice to say this pedal operates at a very high level of noise reduction. It will track the signal from your guitar and apply the threshold where appropriate giving you a decay of the note that is sustained yet smooth. No sudden disappearance of the signal with this pedal because it cannot determine between the note and unwanted noise. There is a very gentle and almost polite quieting of the sound as the noise gate gradually comes in. You do though have to be careful with how you use it, as it is quite sensitive and you don’t lose any natural sustain from the guitar. 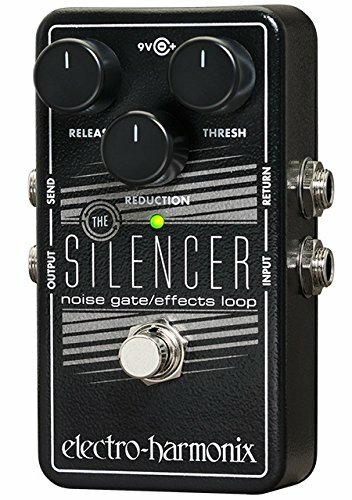 Normally you would consider placing a pedal like this after overdrive, fuzz, etc and before reverb but with this pedal, it doesn’t seem to matter that much and it operates well anywhere in the chain. It is built with a very strong structure and will take a fair amount of the punishment that pedals normally get. In fact, I doubt it would even notice. The principal control is a single threshold but needs to be appreciated for what it offers. Despite this being a very powerful tool in noise control it does not impact the sound of your guitar. There is no doubt that the Decimator is towards the top of the pile in its field. Of course, it will take some understanding of how to get the best from it but then that is normal for pedals that offer a bit more. Operates on a 9v battery or a power supply which is not supplied. Priced towards the top end. Quality pedal reducing unwanted noise to a minimum. Works anywhere in the pedal chain. Improved technology offers more noise reduction options. 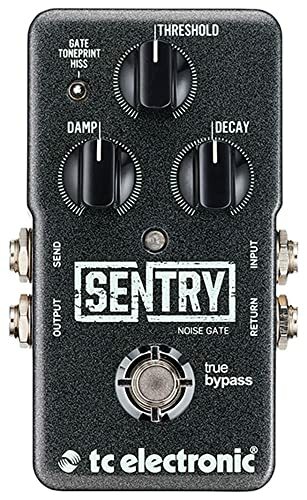 TC Electronics Sentry pedal is an upmarket pedal offering a wide range of possibilities. It is a multi-band noise gate pedal that is able to focus in on certain sounds to take away unwanted noise from your signal. The reduction through its hard gate mode is quick and seamless. The pedal has three principle controls, threshold, decay, and damp. Threshold and decay are common terms in gating but damp not so. It simply controls how much of the signal is being attenuated, once you have stopped playing. Decay is as always how quickly the gate shuts. There are also input/output and send/return sockets and the pedal is true bypass. One of the big points about TC pedals is Toneprint and this pedal has that facility. This allows you to download via a USB connection straight to the pedal or from the Toneprint App via a smartphone to the pedal through a guitar pick up. You, therefore, get access to customized settings. To get the best from this facility though you do have to be rather computer literate and it certainly won’t suit everyone. The facility is very good though once you have mastered its usage. This is a high-grade noise reducer and operates on a high level. It will cut out noise from just about anywhere though it is advisable, stupid as it might be to say it, to check all your leads first just to make sure any problems aren’t there. It is not difficult to operate on its basic level but once you start to use its online facilities it does get a little harder. Maybe the future will be downloadable presets on all pedals, but at the moment it’s a novelty and one that needs to be understood. It’s not a cheap pedal but then when you have some serious quality, things never are. Not that easy to use. 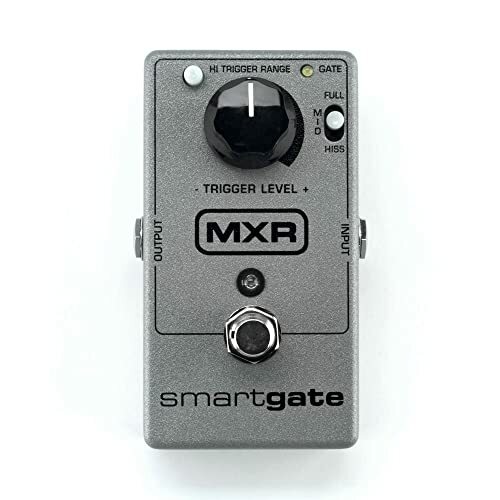 MXR always come up with quality pedals and this noise gate is no exception. It features three distinct types of suppression choices, full, mid and hiss. These will deal with just about every kind of unwanted noise there is. It will though not cut your notes and allows what you are playing to pass through as it recognizes the difference between your sound and anything that should not be there. You can let that sustain ring out and it won’t cut you off until your sound falls below its threshold. It will react slowly to your sustain but its fast attack time allows it to step in when the notes are shorter. It’s a very efficient pedal and depending on where you place it in your effects chain it will cut out noise from other pedals, even those being driven hard. It is a well-built and made to take a little punishment and survive, which pedals have to at times. It’s easy to use and with basic but efficient controls. The threshold trigger is accurate and easily set and adjusted. 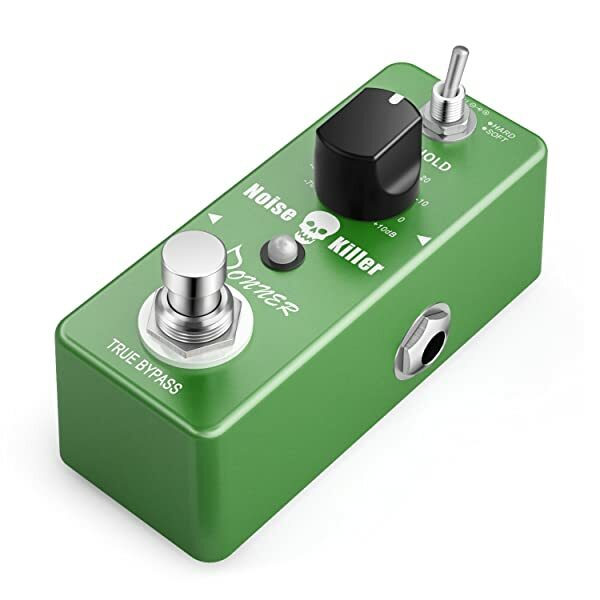 MXR have come up with a neat little pedal with this. It is nothing particularly fancy but it does its job and does it very well and that is the most important thing. It will eradicate all sorts of noise and once you have mastered what are basically easy controls then unwanted noise should cease to be a problem. It’s set at a realistic price, just about midway, and therefore represents very good value for money. Can affect the tone of the guitar at times if the attack is high. 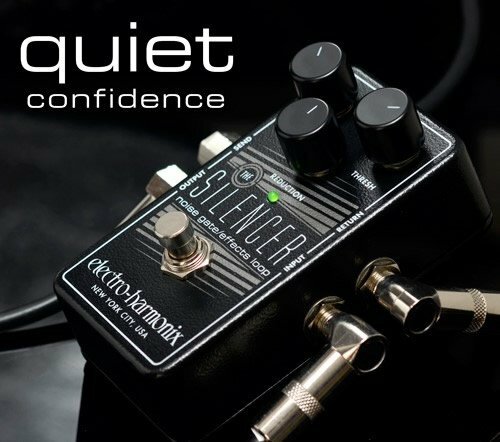 Electro Harmonix’s contribution to reducing unwanted noise is their Silencer. It is quite a small unobtrusive pedal but it is tough and will take the knocks. They are well known as a manufacturer for producing affordable pedals that are efficient and practical. They are also known for being creative in their approach to design but with this noise gate, they have kept it simple. Controls are basic with threshold, release, and reduction and it has input and output sockets as well as send and return options. The threshold will control how much signal is required to open the noise gate and allow the signal through. The reduction controls the amount reduced on the gated signal and the release control how long the gate will be open after the signal falls below the threshold you have set. The reduction will allow up to -70db and the release time to a maximum of 4 seconds. It is a noise gate with a built-in effects loop which means it can be used as an inline noise gate or on a loop to get rid of noise from identifiable effects pedals. We would not call it the most sophisticated pedal in the range but it certainly has enough options and controls to do its job. The controls are easy to use and the results easily adjusted to eliminate the unwanted sound. It is simple to use and quite basic, doesn’t have too many bells and whistles, but it does what you need it to and at a price that is really very cheap for what you are getting. Certainly worth consideration when looking at what pedals are the best value for money. Some will require more operational options. 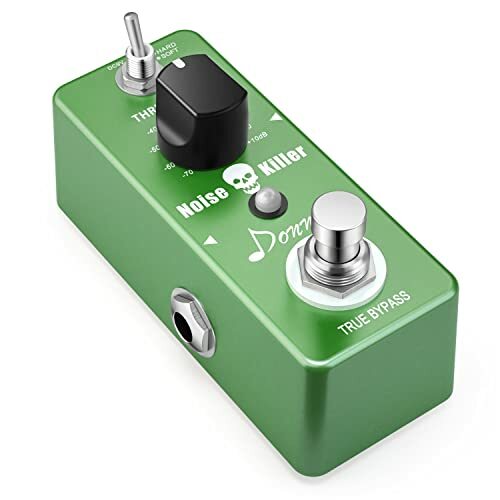 Donner is another manufacturer known for producing quality, affordable effects pedals. They usually keep their designs and pedal operations very simple and basic and that can be a very good thing for some users. This noise gate pedal is no exception. The controls are very simple and consist of just a threshold, an LED pedal status, and a hard or soft toggle switch. This switch sets the pedal in one of two modes, hard or soft. Setting it too hard will really attack the noise levels and may interfere a little bit with your overall sound so it should be used in conjunction with the threshold with some caution. That is not to say it is of no value. There are times when you may need an aggressive attack level to rid a certain noise and in hard mode, it will do that. Soft though is more manageable with good results. It does sound rather oversimplified to use but you just select hard or soft and then adjust the threshold until the noise is gone. It really does not come any easier than that. Of course, this pedal does not come with the sophisticated operating modes of some pedals and the price reflects that. Donner has come up with a good pedal that will do a job and do it with as less fuss as possible. The casing is made from aluminum alloy and is rugged and the unit takes a 9v battery. Excellent value for money pedal. Some will require more options for ridding unwanted noise. Behringer is yet another manufacturer of effects pedals that are both functional and cost-effective. It might be unfair to them to describe them as functional, they are better than that, and the quality you will get from a Behringer pedal sometimes defies its price. As a company, they seem to concentrate their efforts on performance rather than looks for which they should be applauded. 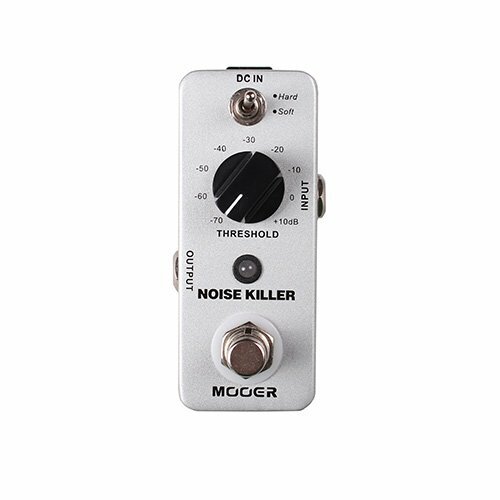 The controls are basic and easy to use and the pedal operates within two basic modes mute and reduction. There are threshold and decay controls which perform the usual functions and work in tandem with your mode selection. The controls will allow you to adjust the amount of noise reduced without interfering completely with your own sound. Bear in mind this is a premium pedal and whilst it is, it will allow the setup of loops. A good feature in a premium pedal. Its performance is very good but you should be a little wary of its construction. It will not take a lot of abuse and therefore a little care is required. It runs on a 9v battery or a power supply which is not supplied. A good pedal at a budget price. Behringer does the job again. Not as rugged as other pedals. The first thing you will notice about this pedal is its size. Compared with some pedals it seems like it’s been underfed, but it doesn’t perform that way at all. Compact might be the best way to describe it. Built for ease of use it has a threshold control and a toggle switch for a hard or a soft setting. That is about all the controls you have, some might say need, so it cannot be said it is complicated to use. The hard setting will provide an aggressive attack on the sound which can be quite dramatic so it needs to be used in conjunction with the threshold to get its performance right. The soft setting is a much easier form of reduction and gradual in its sound. This is a no frills pedal and is designed simply to do a job as efficiently as it can. It does that, even though it is operating on a very basic level. It does what it says it will do and that eliminates unwanted noise from any source. We have made comment about its size, and it is quite small, but it is a tough little pedal and is rugged enough to survive. The small size physically might be an advantage to players with already jammed boards. As a premium cost pedal it represents excellent value. It is well built and not intrusive and it will do its job. It comes with its ac power supply. Some will want more control and options. Hum, hiss, buzz, we’ve all had it at some point and it can be a nightmare. And it’s always those naughty loud guitar players who can’t move on the stage for their effects pedals that cause it. (sorry, that was a bass players joke). Whoever causes these unwanted noises, it has to be removed. At one time we didn’t have the technology, but now we do. Noise gates are quite basic effects that usually have easy to operate controls that can get rid of the noise. I sometimes wonder how many guitar players actually use one. Looking at the number of controls on the pedals they look very easy. Twist one or two knobs and that is it. The truth though is to get the best out of them is a little bit more complex. If you are considering adding one of these which are to us, essential pieces of modern-day kit, to your board then you need to evaluate what each will do and whether it will suit your set up. It is very easy to buy one, plug it in and just expect it to work. You don’t do that with reverb or overdrive, why do it with a noise gate. To get the best from your pedal you first need to understand your own sound. It is a little bit of trial and error to ensure that using the noise gate doesn’t actually mess up your sound which results in you turning it off. When you think if what it can do for you in cutting out unwanted noise then you realize it is a very clever piece of tech. Cutting out noise of course, but what sort of noise? White noise, maybe a noisy pickup on the guitar, a bad lead, too much overdrive producing a vicious hiss, could be anything. If it is a simple overload somewhere then the job could be done by a premium model with no fuss and a small cost. However, if it is a number of things not directly related to each other you will need a more sophisticated gate that will have send and return options to set up loops to clean certain pedals. Choosing the best noise gate pedal is about knowing your gear and what you want the pedal to do. It is a brilliant piece of equipment and should be a part of every guitar players board. The pedals we have reviewed are all excellent and will work their magic at whatever level you decide you require. Not an easy choice. We want it to be sturdy and able to take the necessary use and we want it to fulfill its basic function but also have a little more in reserve just in case something occurs in the future. We also want it not to break the bank. Reliable, functionary and it’s been around a long time. It’s a class act.